This is really a follow up to my "Where to get Ideas" post of a few weeks ago. I've been on a bit of a coding binge recently creating 16 Windows 8 apps in the last month and a half. The biggest challenge, as I have said before, is often coming up with somewhat new and interesting ideas for apps. In a previous entry I talked about a few ways that I get app ideas. I did come up with one more way. Mine history. And I mean mine as in miner-forty-niner, not "it's mine!" Cultures around the world have been playing games for all of recorded time (and likely before recorded time but how would we know? It wasn't recorded). Many of our childhood games and parent games are based on historical games. I was just watching Jimmy Fallon the other night and he played game. You probably thought those cave drawings from the stone age were ancient methods of story telling. Nope... Pictionary. I'm sure many a cave-man was eaten while doing charades about some sort of beasty eating another beasty and was just not paying attention. 20 questions? Been done... I'm sure you've heard of the Spanish Inquisition. It was just a misunderstood game of 20 questions. Seriously though, there are many folk games that translate quite well to Apps. 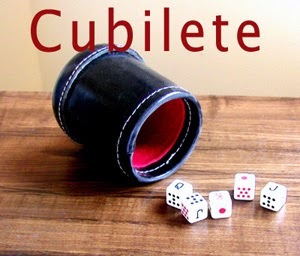 I just completed a game called Cubilete. It was a dice game played in Cuba using poker dice. Once I started created the app and the artificial intelligence computer player I learned it was a pretty fun game. Now, to be fair the game was used for gambling and drinking and you can't really say that in the store description but it really is fun and stands on it's own when playing against other players. Everybody has a different perspective on history. Look into your own, your family's and see if there might be gold you can mine for your next game. Often there is a reason those games were handed down through generations. They were fun, simple and easy to play. The definition of a successful Phone or Windows app! If you have written a culturally historical game, post a comment here describing the game, maybe with a store link so we can have a go at it!